Now that looks like a fun way to spend the weekend! I was starting to be under the impression that summer was not allowed in Alaska. So glad to see some nice weather make it up your way. wow all weekend?! that's impressive! Well, I did make them come in for meals and to sleep at night . . . ! That looks like so much fun! 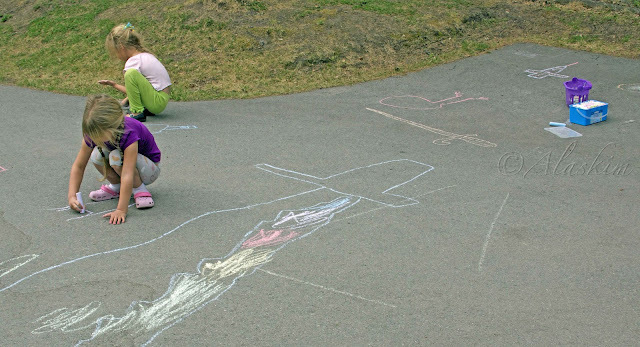 Makes me want to be a kid again and draw pictures in the driveway. Oh wait. When I was a kid we didn't have sidewalk chalk. And even if we did I'm sure I wouldn't have been allowed to use it in the driveway. Now that you say that, I can see the swords. ummm...I knew that!!! well not really..but I know now!!! I miss my chalk-road writing days!!!! I'm glad the summer fun has begun!!! yaayness!! !